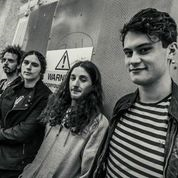 Machine People are an engaging 4 piece Alt-Rock band from Brighton, UK. The band released their debut album, Thought Police, in April 2014 and have recently completed material for album two – to be released in early 2015. The debut album ‘Thought Police’ unleashes an uneasy embrace of the classic meeting the alternative, a melting pot infusing with gritty e l e g a n c e , e q u a n i m i t y a n d disturbed dystopian coolness. ‘Thought Police’ is, in essence, an alt-rock album for the digital age with the realisation or resurgence of all things Orwellian. An outstanding and intelligent debut offering, Thought Police not only stands strong as a tour de force in its own entity but also effectively sets the scene for things to come. The album is available on iTunes, Bandcamp, Amazon and hundreds of stores worldwide. Videos for ‘Thought Police’ and ‘ECIG’ are available on YouTube.